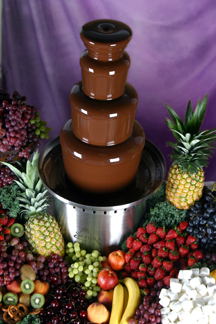 Chocolate Fountains - Chocolate to make an impressive splash at your party! Choice of milk, dark or white chocolate (we can even dye the white chocolate for your favorite color). Kosher certificate available upon request - dairy or parve. Includes 3 hours of service, attendant, bamboo skewers, cocktail napkins, delivery and set up.